It appears as if love is in the air in Westeros, and we are all for it. HBO has just dropped a few brand new images from the upcoming Game of Thrones Season 7, and it looks like our favorite will-they-won’t-they couple is still at it. And we’re talking about Tormund and Brienne, as if there’s any other couple we’re rooting for right now. If you can remember back to last year (which suddenly seems like so long ago), Season 6 clearly established that the wildling Tormund happened to be quite smitten with our fierce lady warrior, Brienne. And TBH, we were all like SAME. We immediately started sailing on the S.S. Tormund and Brienne, because this is a ship we can get behind. If there’s anyone we want to find happiness in Westeros, it’s Brienne. Specifically, with Tormund. Well, judging from the first released images of Season 7, it’s clear that this fire is still burning, at least from one of them. LOOK AT HIS FACE. He is all like: . Gosh, ladies. 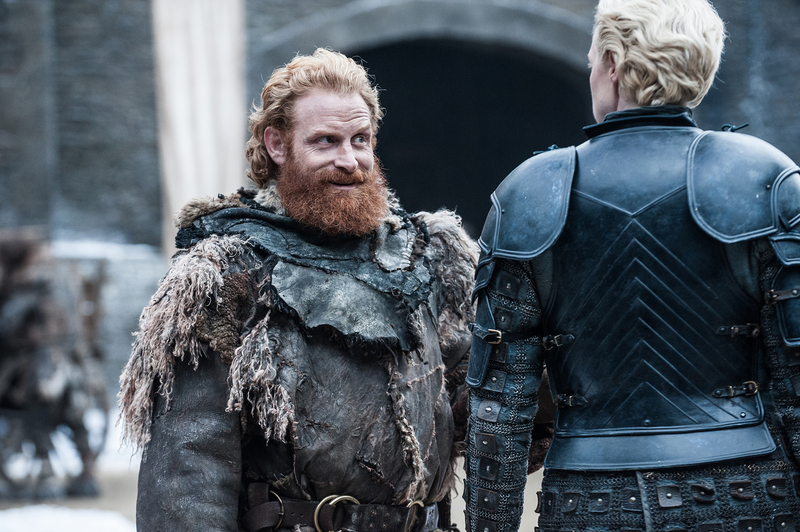 Get yourself a wildling who will look at you the same way Tormund looks at Brienne. Unfortunately, we can’t see Brienne’s face, but it’s easy to guess it looks something like this: . At least we hope. It’s unclear where these two crazy love-birds will be when Season 7 picks up, let alone where Season 7 takes them. But hopefully, it’s towards their very own happy ending. If those things even exist in Westeros.